Summary: What’s missing in writing instruction that focuses on organization, vocabulary and sentence structure? What is the role of thinking in writing, and how can we make thinking visible in writing? This article, which could provide a useful focus for a study group or other professional development session, captures a discussion of writing as a mode of learning and the role that evaluation plays in writing across the disciplines. of evaluation in writing, and writing across disciplines. They discuss how engaging in the slow and deep thinking that writing requires deepens reading comprehension. They also talk about the prescriptive nature of writing programs and the push for standards. Significant in this conversation is how Danling and Jane extend our own thinking about how to make the writing process a bit more visible for our emerging writers. This excerpted conversation was recorded on January 11, 2012, and has been edited for publication. The full conversation is available as a podcast. LA: The first question I’d like to pose to the two of you is how might we, as language arts educators, put thinking back into the school writing curriculum? Jane: Danling, would you like to start? Danling: Okay. Now in our teaching of writing, if there is any teaching of writing, we hear much talk about the focus, organization, elaboration, details, or even descriptive words, variety of sentence structures, or some people even talk about peer-teacher conferences. But we read the student’s work and think “he’s so shallow” because although the writing might be wordy and lengthy, it is without depth or not well thought through. So, while we talk about high-order thinking or critical thinking in our teacher programs or in inservice workshops, teacher workshops, or even our curriculum standards, we don’t actually see the depth of thinking demonstrated in our teaching or in our students’ work. So I think it’s very important to bring the thinking back and into our writing. 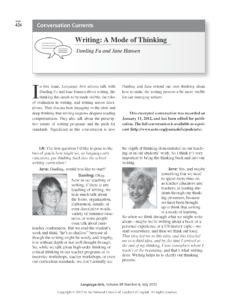 Jane: Yes, and maybe something that we need to spend more time on, as teacher educators and teachers, is leading students through our thinking processes, because we have been brought up to think that writing is a mode of learning. So when we think through what we might write about—maybe we’re writing about a book or a personal experience or a US history topic—we start somewhere, and then we think out loud, That idea led me to this idea, and this idea led me to a third idea, and by the time I arrived at the end of my thinking, I was someplace where I wasn’t at the beginning, and that’s what writing does. Writing helps us to clarify our thinking process. Danling: Yes. I so agree. We need to stress demonstrating more thinking and thinking process in our teaching of writing. And we need to teach writing in every subject, not just in language arts. Because writing deepens reading comprehension, subject knowledge learning—math, science, social studies, language development. So without writing, which allows people to engage in slow thinking or deep thinking, we read, but we may not reach certain levels of understanding or remember well what we have read. We learn the subject knowledge, but may not digest well the new concepts; we study language and may recognize language rules and vocabulary, but we may not own the language rules and words, we may not use them to think, to express, to dig deeper into our thinking. Writing can enable this, it can help deep thinking happen. Jane: It seems like we need to maybe bring back the notion of the draft. I think sometimes it has gotten lost. The draft is where we go through our thinking. We think about it and we keep writing and we think about it some more and we keep writing. And then after we have finished a draft and maybe talked about it, then, when we revise, we start to rethink and sort of focus in and clarify our thinking. It seems like we maybe have short-circuited writing. Danling: Yes! Yes, yes. You know, I do think revision is the core of writing. That’s what separates it from speaking, because revision is rethinking, reorganizing our thoughts, re-reviewing our presentation, and rewording or re-finding our expressions. It’s not as simple as making changes to surface-level content or structure; it goes deeper to thought process, so I think revision is often misinterpreted in our teaching of writing. Jane: I think part of the thinking, and what is missing sometimes, is ongoing writing because our thinking is ongoing. Students, regardless of their age, need to write frequently, so after they start a piece of writing, they can pick it up and keep writing and pick it up again and keep writing. Writers want time and several opportunities to continue to think about whatever their topic is—just like reading a book. You read it for a while and you continue and you continue, but you don’t put it aside for very long because then you forget where you are. LA: We really like those ideas, Danling and Jane. And we’re wondering about the concern of time, because we constantly hear in our courses and working with teachers that there just seems to be a lack of time to do this sort of deep thinking that we’re talking about. Can either of you address how you might work with teachers to help them to re-craft their time? Danling: You know, when we say we don’t have time, it really means we are trying to cover too much. But I don’t think the goal of teaching is to cover, so when we think time is an issue, we should cover less but really learn what we do study. That’s what I believe. Jane: I also think that time has to do with priorities. We have time for something, because we have 45 minutes for writing class every single day, or maybe even longer if we have block scheduling. We fill that time, so what is it that we really think matters? Danling: Yes, when I go to the school, I look at the question of time. I ask, “Do you have 45 minutes or more of writing?” Yes, they have it, but when you look at how they use it, you hear, “Okay, let’s write. Use beautiful language, use big words and pay attention to the sentence correctness.” I just feel like there is so much stress on the surface level, not the thinking. So I don’t think we require our students to do enough of the kind of writing we’re talking about. Depth of writing should progress from elementary to college. Even though we include writing in our school standards, we focus on writing as funny, exciting, entertaining—whatever it takes to attract audience attention, to make people laugh—but we rarely strive to make people think. We just don’t require student writers to put much thinking into their writing, so that’s one reason why we struggle to make readers think. We stress the correctness, the so-called beautiful language in writing, but the depth and logic of thinking are not there. I believe we waste a lot of time in our teaching. Jane: Danling, maybe you could say a little bit about this as you see it in the field of English language learners. Danling: You know, we always see English language learners and think they are learning language, so when teachers have ELL students write, they stress language learning, not thinking. So writing for ELLs is mostly a writing exercise, language practice, it’s never treated as expression or thinking. If we want ELLs to write, they have to use their first language or more proficient language to think for their writing. Real writing is not just a language exercise; it is a thoughtful expression and exploration. If the students are forced to think with their limited proficient language, their thinking and ideas will be very limited. Jane: You know, I’m afraid that some of what you’re saying also applies to classrooms where there aren’t very many English Language Learners, or where we’re not necessarily thinking about ELLs. A friend of mine in another state—he was either a fourth- or a fifth-grade teacher—went to a colleague’s classroom for 45 minutes to observe writing instruction. What the students did during this “writing” block was fill in worksheets and copy text. That’s what this well-meaning teacher perceived as writing. So the whole notion of “What is writing?” seems to be very basic. LA: Yeah, we think that’s a really important point, Jane, this concept of what writing is. As we move into all different sorts of digital technologies, how we write and communicate is shifting. We do feel like our writing curriculum has become static and that even well-intentioned teachers who are really working hard to do the right things don’t seem to have a generative perspective around what writing is and how to push children into more thoughtful compositions. Jane: I think that is part of the big picture; in some ways, technology—or lack of technology— has made this goal of thoughtful writing even more complicated. I was in a school yesterday, and the students really didn’t have access to technology in the way that we’re talking about right now. They had to write on paper. They could check out computers by signing up beforehand, but only for the day and not every day. We all know that when you are working all the way through a piece of writing, from jotting ideas to a finished piece, you have to have a computer consistently available to you over a period of time. That’s just not possible in many schools. LA: Right. Right. So we have to keep in mind, then, that as teachers work with kids in classrooms, we are using all sorts of technologies, whether that’s paper and pencil, an occasional computer, smart phone technologies, whiteboards, all of those options. But at the heart of it all is this: What is it that children are composing? Is their writing generated by responding to prompts and prescriptive curriculum or are we giving them space to bring their own lives and experiences into that writing curriculum? Jane: Let’s think for a minute about what you said with regard to the writing of younger children, pre-kindergarten and kindergarten children. They write every day and, in many cases, of course, their writing is drawing. I’m thinking of children who are not yet able to write their name, but they do write, and they write with intention and really want it to be good. A little girl, for example, spent days learning how to draw a tree. That was her writing. She kept saying, “Look at my writin’, look at my writin’.” And then after several days, she held up this sheet of paper and she said, “This is my tree.” For days she had worked on one tree after another, each one a little different. She was intentional about learning how to write; she worked at it. As teachers, we need to give students the tools and support to be really engaged in this act of writing, to really work on it because they care about it. LA: Exactly. Exactly. And my experience has been that when kids have those opportunities to write from the known, we see better pieces produced because they care about it, they have an investment in it, and they want to be able to tell the experience or the story in a particular way. Danling: You know, by using technology—a lot of schools have a whiteboard or a smart-board—teachers can easily demonstrate their thinking in front of the students. We don’t do that enough; we should teach thinking through writing. We all think. Children ask questions, wondering all the time. So we can demonstrate our thinking process to our students, explain what’s going through our mind. Let them know that when we read, we ask ourselves what’s going on? We can share how we process our new learning when we first encounter concepts in a subject area. When we work on a writing assignment, we should describe how we think through the topic, narrow down the focus, select the details, and work on the language. We just don’t demonstrate our authentic natural thinking process enough. LA: Do either of you feel that one of the issues that we face is the lack of really strong professional development in writing at the preservice and inservice levels? We think we have teachers who may not feel comfortable in this particular curriculum, so they go for those surface features, because they don’t really have a sense of how to go deeper with a child. Danling: Yeah, I think that’s true at every level. Teachers never get enough of this in their preservice education or their inservice professional development. When we talk about preservice and inservice, we can anticipate teachers are getting help with meeting standards, but how much time do we really spend helping teachers become thinkers themselves? Jane: I think one of the things we need to learn more about is inservice. In other words, I think we probably know reasonably well how to teach writing at the college level, even though I think the main problem there is that many teachers never have the chance to take a writing class. But I think we really need to think about how to provide effective inservice for teachers who are already teaching writing in their schools and would like to become better at it. Do you do very much of that, Danling? Danling: I don’t think I do enough. It takes time, but so often you give a one-time-shot workshop, and teachers don’t get the chance to absorb it and try it out before they have to teach it. A lot of times, teachers only begin to understand it—the surface level—and then they are required to do something in class that they don’t understand well. Too often, that’s the inservice. It’s too quick, everything is quick: do it, get the inservice and do it, there’s not enough time. So that’s why when a school board asks me to do a single workshop, I say one workshop won’t help. Learning is a long process. If we don’t do it well, we can turn good ideas into bad or poor practice. LA: Right. We also wonder if it has to do with the fact that writing is not so much a prescriptive program. It’s not as tangible, perhaps, as other things are, so it requires even more time to really understand and invest oneself in the process. Jane: Yes, we know that we should provide authentic writing instruction, and in order to do that, classroom teachers and we teacher-educators need to know about writing first-hand. In other words, I think the main problem with preservice education is that many teachers never have the chance to take a writing class, not necessarily that we don’t know how to teach those courses. And we also need to study professional writers. That’s one of the reasons why the notion of a mentor text has come into play, and not just mentor texts, it’s also mentor authors. These days, we can learn about authors via the Internet so easily and find out what it really is that writers do when they write. If we have that knowledge, it keeps us from becoming trapped by a curriculum; it helps us to know how to use the curriculum in a way that actually reflects what it is that writers do. Writers, for example, don’t follow formulas, they just don’t. I mean they spend their lifetimes trying not to be formulaic, because they don’t want to sound like anybody else. Danling: That’s why it’s harder, because thinking is not tangible. And you cannot reduce thinking to a formula. Everybody thinks differently based on their background and their specific context. I think it’s hard to teach, but it shouldn’t be quite so hard if we are really open to sharing our thoughts and processes. Sometimes we’re so nervous to share our inner thoughts, worried that we must share only refined thinking. But you don’t have to begin with refined thinking. Thinking is constantly generated and refined. Jane: Exactly, and people—teachers, adults in our classes—really are afraid to write. They tell stories about occasions when their writing was royally criticized. Danling: One of the reasons we have a hard time teaching writing and sharing our thinking is because we were never taught like this; we’ve never actually seen it. So teachers who have never been taught this way and have never seen it tend to do something very formulaic. But we have to start somewhere. Jane: That’s true. And one of the reasons that writing is receiving some attention—maybe this is good, maybe this is bad—is because of all the testing that’s coming about now. We haven’t really spent much time talking about that, but if you really stop and think about it, the testing shouldn’t interfere. Often, however, that seems to happen. I believe good teaching can continue and students will score well. Danling: You know, the testing is all about the standards. I grew up in the country with the national standards, all these kinds of tests. But the standards in and of themselves are not wrong. It’s the way we let ourselves be limited, constrained by the standards; we are driven by the standards instead of driven by our knowledge of our students. That is wrong. When teachers prepare for testing, they analyze the writing samples: this writing sample gets a 6, or this writing sample gets a 4, and we compare our students’ writing with those samples. They talk a lot about comparing the writing samples instead of really showing the students how to develop their ideas and improve their writing, to get better. You know, analyzing somebody else’s writing is too distant. We waste students’ time on certain kinds of things, and then we don’t do the key things to help students really think well and define their own ideas and language. Jane: Maybe students really need to be the ones comparing. We could say, “Here are some writing samples; these six students all got a 5 and look at how different their writing is.” That way, students can see, as individual writers, that there are a lot of variations in the ways good writers write. They need to know that the intent is not that they all write or think similarly. It’s important to really play up this notion of individuality as a writer. Danling: I would like the students who got a 5 to show the class how they write, how they work to improve their writing. Students can give each other writing lessons. And we should let our students share not just their finished work, but their writing process and their revision process as well. Jane: Well, that’s a lot like where we started; we were saying teachers need to show their thinking processes. So what you’re saying now is that the students who have created well-crafted drafts or pieces of writing—or maybe all students?—for them to talk about their thinking process, what they went through in order to arrive at that place. And they could start doing that as young students. They could start talking about that even when they’re little. If they did that all the way through, whoa what a difference that might make! Danling: Just like you said earlier about the kindergartener working on the trees, you know, every tree is different, so she can share her process: here’s how in each piece I made a difference to improve my trees. Jane: Yes, definitely. And how it’s better each time, but how she’s not satisfied with it yet. Danling: Yeah, why I didn’t like it, why I added things, why I made it different. So this kind of process, peer demonstration, could be much more powerful than the teacher demonstration. LA: We think it really does go back to the beginning where we were talking about this idea of being very thoughtful, almost at a metacognitive level, about the intentions that our young writers have or our college student writers have or our teachers have or that we have. Through that ability to be reflective on your own practice, you can really deepen what you know and understand about the process. Jane: And you know that’s another form of writing—students can write about the piece of writing that they just finished. LA: Exactly. Well our time is rapidly coming to a close, so we’d like both of you to think about the future and which one or two points you would like to take out into the world of language arts educators to help them reshape, re-envision, and re-craft their writing curriculum? Danling: I think I’m going back to the very beginning. I think we should put thinking at the core of the writing we teach—in every subject, in every grade. We must teach thinking before we teach anything else. Jane: And I’ll add that I think we ought to be sure to include many genres throughout students’ lives as writers. They need to be familiar with what they might do when they write songs, not just when they write essays and narratives. I think writing in the various genres can really inform you as a writer. And then, also, I think another thing we really need to come to as educators, from college educators to second-grade teachers, is the value of writing—when I write about something, I can actually come to understand it better, and when someone takes away writing as a mode of learning, they really place me at a disadvantage. LA: Thank you both very much. We really enjoyed the conversation.